Spoiler warning: The critic will give away the end of the movie in the third to last paragraph of this review. If you intend to see the film, by all that is holy stop reading before then. You have been warned. If you want to use a genre movie - sci-fi, action, musical, whatever - to make a larger statement about humanity, it's best to keep things lean and tight by inserting said message into the metaphorical cracks. This is what the first two versions of "Invasion of the Body Snatchers" did, and that worked out nicely. That bloated sense of purpose turns what could have been a nifty B-movie into a strained, two-hours-plus "Twilight Zone" episode, and, believe me, Darabont's no Rod Serling. I'm serious: Major spoilers ahead. Stephen King has publicly stated that anyone who spills the beans deserves the death penalty, but I'm willing to take the risk. Like the old John Carpenter shrieker "The Fog," "The Mist" gets rolling when a mysterious cloud bank descends on a coastal town (this being Stephen King, we're in Maine). There are things in this unholy white-out, they have teeth, and they're extremely hungry. So far, so good. The filmmaker has been watching a lot of Hitchcock, and "The Mist" plays like the diner sequence in "The Birds" padded to fill an entire movie. There's been a nasty storm the night before, and the supermarket is filled with locals and weekend Richie Riches filling up their grocery carts. They're all trapped inside when the fog comes down, and we're trapped with them. Our hero is David Drayton (Thomas Jane), a successful local movie-poster artist. His young son, Billy (Nathan Gamble), has come shopping with him, as has his New York-attorney neighbor (Andre Braugher), with whom David has a prickly relationship. As the bodies pile up outside, the crowd divides into panicked groups. The local crazy lady (Marcia Gay Harden, biting into her role as if her agent had presented her with a prize ham) starts preaching that it's the end of the world, and the store's weaker vessels start listening to her as the days wear on. David anchors a saner group that includes assistant store manager Ollie (Toby Jones - the other Truman Capote), a feisty schoolmarm (Frances Sternhagen), and several others. And, look, here's the town's pretty new schoolteacher Amanda, played by Laurie Holden with Tippi Hedren's hair and Kim Novak's "Vertigo" wardrobe. You think I'm kidding? I'm not. SPOILERS SPOILERS SPOILERS. Can I make this any clearer? The set-up, then, is 50 or so little Indians, with hellspawn banging on the windows outside. (There's a cursory explanation; this being King, it involves the military.) Darabont's more interested in watching his characters call each other out over perceived class differences, though; he also gives Harden about 10 too many apocalyptic rants about the "Book of Revelations" (sic). Don't expect the movie to play well in the Bible Belt. Don't expect it to play with the Motion Picture Editor's Guild, either, since there appears to have been a cutting-room lock-out. 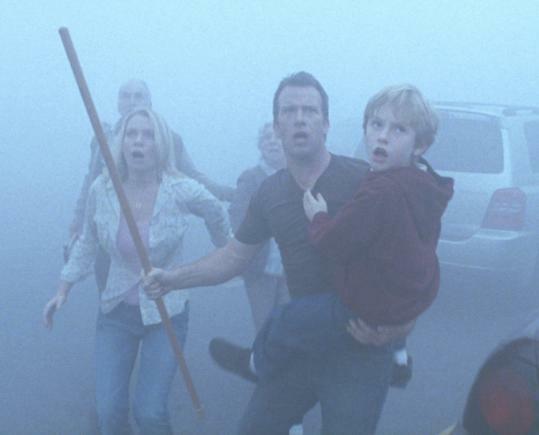 Despite all this, "The Mist" holds its tension for the most part, alternating frenzied eek-eek-eek sequences with periods of taut, silent dread. The special effects are well done, and the ones that aren't are hidden by that convenient fog. After a while, though, the movie wants to make big statements about the Madness of Crowds, and at this length they're trite and heavy-handed. Then, as if to underscore that he's above such silly things as sci-fi and horror, Darabont throws his curveball of an ending. (OK, last chance. Exit's that way. Abandon hope all ye who enter here.) Having escaped with three others, David and little Billy drive through the mist until their car runs out of gas. Around them are the shrieks of horrible things ready to pounce and rend. The five humans have a gun with four bullets; David does what he must and exits the car alone to await his fate. Two minutes later the army shows up. Bum-mer. I don't think you have to be a parent to hate a movie that ends with the kid getting shot in the head by his dad. As a favor. And just think: All they had to do was turn on the car radio. Someone must think such a finale is dark and daringly tragic and uncomfortable and cool. Someone is wrong. "The Mist" doesn't provoke further thought; it provokes active annoyance at being punished in the service of a pulp morality tale with pretensions. Even Hitchcock knew that: When he blew up the little boy in the bus in 1936's "Sabotage," he ended up having to issue a public apology. And Darabont, need I say it, is no Hitchcock. Ty Burr can be reached at tburr@globe.com, unless you're Stephen King, in which case he has moved to Tierra del Fuego with no forwarding address. For more on movies, go to boston.com/ae/movies/blog.